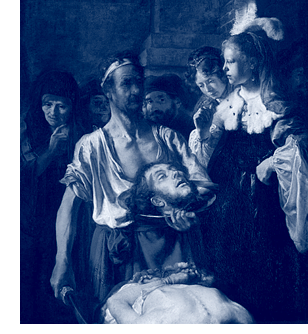 Today (29 August 2011) has been the memorial of the Beheading of John the Baptist—one of the more colorful feasts on the Church calendar. Beyond the blood and guts, it has something deep to teach us, I believe, about masculine spirituality. The Gospel passage that recounts this story (c.f., Mark 6:17-29) strikes me as having three main characters. The first is John the Baptist; the second is Herod the Tetrarch; and the third, though unmentioned, is Jesus the Christ. John has a decision to make. Which side should he take? He could take the side of King Herod, the earthly king who wants his unlawful marriage to his brother’s wife to be sanctioned. Or he could take the side of the Eternal King, Who gave us the Sacrament of Holy Matrimony. How strikingly similar the Baptizer’s situation was to the situation of Sir Thomas More, fifteen centuries later. Thomas could have sided with King Henry VIII, who wanted his divorce and remarriage to be approved by the Pope. Or he could remain faithful to the Lord and to His Church by upholding the sanctity and permanence of marriage. Both St. John the Baptist and St. Thomas More had the same decision to make. They both made the same decision. They were both imprisoned for it. And they both were beheaded as a consequence. On the scaffold, Thomas More declared: “I die the king’s good servant, but God’s first.” We need to look no further for the model of authentically masculine spirituality.